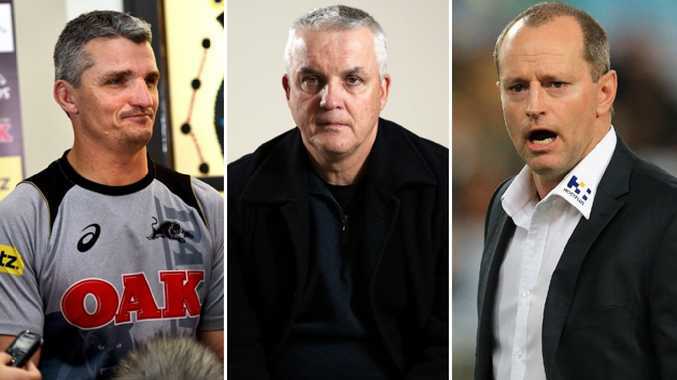 The Panthers will be paying a hefty price for flicking Anthony Griffin (middle) and luring Ivan Cleary (left) away from the Tigers. 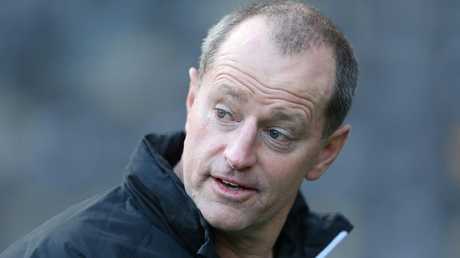 PENRITH will pay for most of Michael Maguire's salary for the first year of his employment at Wests Tigers. 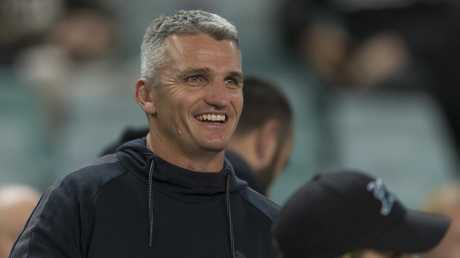 In the wake of Ivan Cleary's defection back to the club that sacked him three years ago, the Tigers will pocket a huge ­financial settlement, believed to be in the vicinity of $400,000, to let Cleary walk from the final two years of his contract. It means Penrith will be outlaying the best part of $2 million on three coaches next year - their own, one they sacked and the other who is working at a rival club. Penrith dumped Anthony Griffin in August, despite signing him to a two-year extension 12 months earlier, and have that payout on their books. It has been reported Cleary will earn close to $1 million a season. 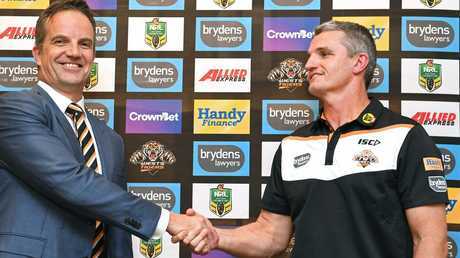 After working through the settlement details, the club informed the Tigers' captaincy group on Friday before all players and staff gathered at Concord on Saturday ahead of Sundday's public announcement on the closure of one of the ugliest break-ups in recent NRL history. While Pascoe would not comment on the settlement figure reached, he was adamant the Tigers had made the most out of a situation the club never asked to be in. "I am not going to talk about it because it is a professional process that has taken place," Pascoe said. "As a club we have been ­really proud of the fact that through these negotiations we have played this out professionally behind closed doors. It will remain behind closed doors. "The conversations we had always, from our perspective, were to get to a point which was to make sure the club came out in the most favourable position possible. "I know we have achieved that through the exit of Ivan and also the acquisition and hiring of Michael." Asked if he believed Tigers fans now deserved an explanation from Cleary, Pascoe said: "Look, I think Ivan has his reasons for wanting to go and coach his son (Nathan). "He has made that very publicly clear. That is a question for Ivan. "But certainly, with all the decisions we have made over the last 12 weeks, I get why it is frustrating for fans, I really do. "And it is not just fans. It is stakeholders who contribute financially to the club. It is the players. It is the staff. It is everyone." And that includes Pascoe, who also lifted the lid on the toll the split took on his close personal friendship with Cleary that dates back years. It has been more than two months since Cleary first read from a prepared statement to deny there was any interest from the Panthers. Pascoe conceded that initially he believed Cleary was not leaving. "When he initially spoke to me on the phone, I think it was approximately five or six days after the initial conversation with Penrith," Pascoe said. "I thought, yeah, he would remain at the club. Asked if they were still mates, Pascoe said: "The simple answer is yes. "But we haven't caught up in the last 12 weeks as mates. We have kept it professional and that is how it is until this point. Look, I feel disappointed in how it has turned out, yes, without doubt. "I think he had done a terrific job at the club. He is a great coach. As I said, the club didn't ask for this outcome. 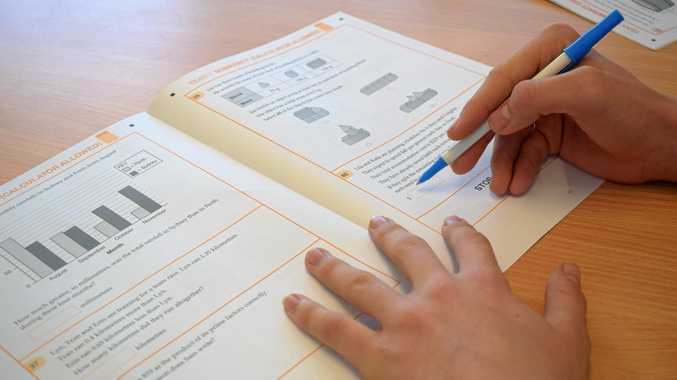 "But we have moved forward as quickly as we can in the most professional manner as possible. "And we are really privileged and proud to have someone of Michael's experience join the club." Not only is Maguire's 62 per cent winning record far superior to Cleary's 48 per cent strike rate, Maguire has also won a premiership in the NRL with South Sydney and in the UK Super League with Wigan. Pascoe and general manager of football, Kelly Egan, flew to New Zealand recently to spend time with Maguire before the Kiwis' Test against Australia. "The one thing that stood out was his passion and fierce determination for winning," Pascoe said. It's cricket like never before. Every Australia home Test, ODI, T20I Match LIVE and ad-break free. SIGN UP TODAY!